Looking for the ultimate in smooth threshold transitions? 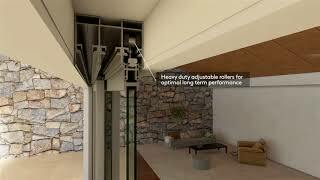 The SlideMASTER™ Top Hung sliding door creates a seamless transition from inside to out. Incorporating an a unique Top hat insert in the sill this door has been designed to comply with disability access regulations, to minimise the risk of trips and falls. The sill insert prevents heals, walking sticks and other objects from becoming stuck in the sill. This is an ideal choice for people looking for a seamless sill transition or building to disability or liveable housing standards. Heavy duty adjustable top hung rollers ensure the door will operate at its optimum for years to come. Elevate Commercial handles and locks which suit the SlideMASTER™ Sliding Door (Top Hung). AWS complementary product options designed for use with SlideMASTER™ Sliding Door (Top Hung). Elevate Commercial windows and doors that share similar style and performance qualities to SlideMASTER™ Sliding Door (Top Hung). Elevate Commercial windows and doors that could be used as an alternative to SlideMASTER™ Sliding Door (Top Hung).